I went last night to the Old Market in Omaha. It is an awesome place for food and music and people watching. I went to hear my friend Luke play at Aroma's. Aroma's is a great coffee shop in the Old Market. Before Luke played I spent a little bit of time walking the streets. There are musicians at each corner trying to make a buck. 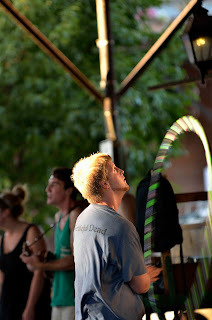 This hula hoop guy was hanging out by one of the group's that was playing. He was really good. Then again, I could never get that dumb hoop to hula...so I think just about anyone who can keep that thing going is really good.